I was in Salt Lake City last Monday the 20th through Friday the 24th attending the Outdoor Retailer Summer Market 2009 show, thanks to Dean and the great guys at Lifelines. Now if I can only convince the powers that be that I need to be there in January to review the same show. Just because I’d…uh…like to see the area with snow on the mountains. That’s it! Got nothing to do with the fact I’ve been a skier since the age of seven…nope. Unfortunately I was unable to blog during the show, so I made notes to gather my thoughts for a post-show post. Did manage a few tweets from the show from the busy bank of PCs at @tradeshowguy. First thing at the show was to respond to several of the tweeters that were doing things to draw people to their booths, like Sole Shoes, who were offering a pair of ‘platinum sandals’ to the first dozen people to come to the booth to say ‘It’s Your Sole!’ Which I did, and they did. Also chatted with some great folks at @ENDFootwear from Portland…not sure who is the Tweeter there, though. Other Twitterers I ran into over the course of the show include: April at @naturallybamboo; Stephanie at @merrelloutside, Brandi at @itsyoursole, Andy the @aquapac designer, Karen and others at @HidesRetainer, Ze’ev at @Zensah, Byron and Davidson of @ecologicdesigns and @greengurugear… Others I couldn’t find as they were never at the booth, or were just too damn busy to come talk to @tradeshowguy! Ah, well, it was great to connect with a handful. And of course at the Tweetup hosted by @PembaServes where I chatted with – among others – Sara Lingafelter (@theclimbergirl) and Fitz Cahall (@dirtbagdiaries) and more…enjoying terrific food and libations at Cedars of Lebanon in downtown Salt Lake City. 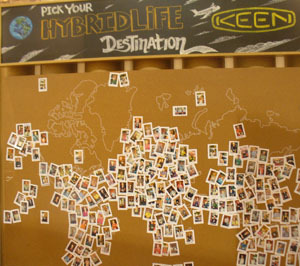 Keen Shoes of Portland: taking photos of people and pinning them to a large bulletin board where they answered the question: where would you like to travel in your Hybrid Life (promoting their hybrid life shoes)? My answer? Jamaica. After collecting names and handing out buttons for three days, Keen gave away $1500 to someone to help them make that trip. No, I didn’t win! During the same time period they gave away the grand prize, Keen also sold a couple of styles of their sandals for $35 (about half price) with all proceeds going to a fund-raiser. GoPro sport camera did a rather loud promotion several times throughout the show, which I stumbled across twice. The founder of the company (don’t think he mentioned his name!) is a natural promoter, getting his crowds to shout out the product name several times. Of course, handing out a couple of dozen GoPro cameras over the course of a few days doesn’t hurt, either! Aquapac had several great nature photos on display and ended up giving a handful away on Thursday afternoon before the big run-up to the grand prize of a Baja Mexico whale-watching trip. Not having been to Outdoor Retail before, I wasn’t sure what to expect. But after walking the floor for an hour, the most obvious thing is that large companies here like LARGE booths, enclosed walls on 3 or 4 sides, second stories and lots of display space. A 100′ x 60′ was not uncommon. Green exhibit construction was also at the forefront, with graphics printed or mounted on cardboard; recovered wood used as booth walls (from barns or old houses); cardboard tubes, and even booths cobbled together from wire fencing, bike frames, small trees – you name it, this show has it. I came away with a strong impression that most of the companies involved are very aware of the impact on the environment of their booth-building choices. Nimlok Design Director Dave Fugiel discusses the evolution of custom tradeshow booth design. Our conversation covers the latest building materials, printing technology and more. Give me an “H”. Give me a “Y” . . . . What’s That Spell? Perhaps no term is more hyped and less understood in the exhibit industry than “Hybrid.” System manufacturers and custom builders are describing their latest and greatest designs as portable hybrids, modular, hybrids, even custom hybrids. Why the emphasis on this term? The answer is simple: value. More than ever, exhibitors are demanding displays that do everything – assemble quickly, look custom, ship light, and reconfigure. Just a few years ago that was impossible, but not now. If you’ve spent any time walking a trade show recently, you’ve noticed the profusion of aluminum and tension fabric graphics. In a nutshell, those are the building blocks of hybrid displays. Aluminum is attractive, structural, and lightweight. Tension fabric is vibrant, durable, and cost-effective. 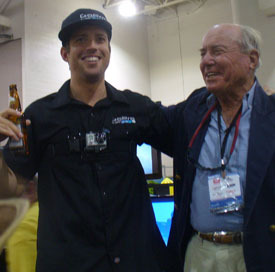 Together they serve as the creative backbone for displays priced from $4,000 to $250,000. But what makes them hybrids? Putting them in context with traditional displays will make the explanation clearer. 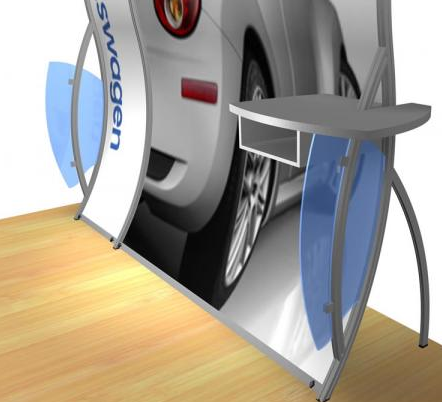 For the past 30 years, the world of portable or modular displays has been dominated by pop ups, panel displays, and modular laminate exhibits. These are “systems” with defined configurations, components, and accessories. Custom exhibits, on the other hand, have offered endless design possibilities since they were built primarily from wood. Hybrids merge those two worlds and are less systems than concepts. Hybrids start with aluminum extrusion (such as Octonorm or MODUL) and tension fabric. Beyond that, the design can be anything and can include anything. There are portable hybrids consisting of an aluminum extrusion frame and tension fabric graphics, which pack in roto-molded wheeled cases. There are modular hybrids which add modular laminate components and pack in roto-molded tubs or small crates. And there are custom hybrids which combine extrusion with just about anything else – metal, wood, plex, glass, and sometimes even portable or modular systems. As with all custom exhibits, it comes down to whatever fulfills the design and marketing requirements for the client. Hybrids may not be the ideal for solution for everyone. 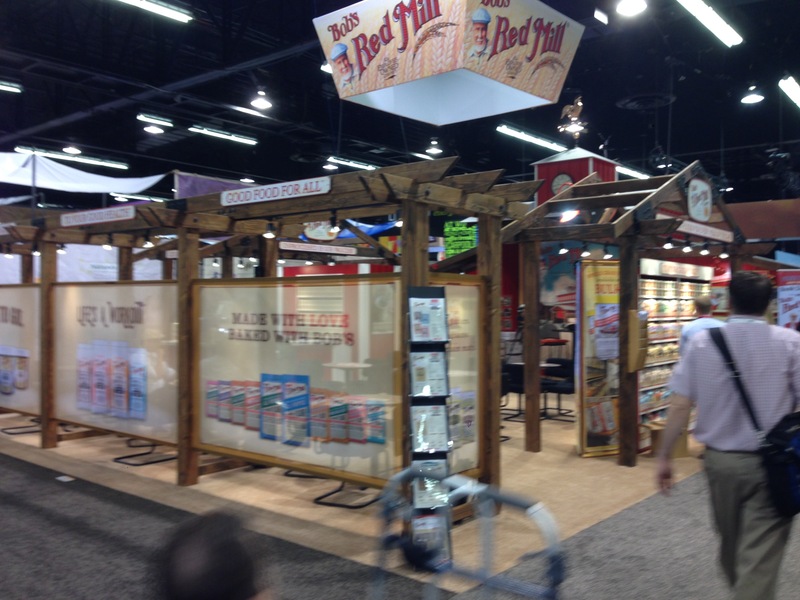 For many exhibitors, a basic pop up or full custom makes more sense for their exhibit marketing goals. However, hybrid exhibits are here to stay until there is a replacement the versatility of aluminum extrusions and the bold impact of tension fabric graphics. Ready for a new custom booth, but don’t know where to start? You might consider putting together an RFP (Request for Proposal) and sending it to 3 – 5 exhibit fabricators. Whatever your approach, make sure you have an internal company discussion that addresses your booth needs: size, branding, budget, function (needs may include display tables, food serving areas, AV equipment, laptop stations, etc. ), transportation (what shows will you attend? ), storage, extra signage, interactive items, etc. Since you’re creating a custom exhibit that you’ll use for years, take your time: after every show, make notes about what works and what doesn’t with your current exhibit. Document what your employees and visitors say. Hold project meetings, get staff input and keep a file. When it’s time to issue the RFP, make it as thorough as possible. Issue the RFP to a handful of exhibit house, be upfront about how many companies you’ve invited to respond, and make sure the budget and timetable are realistic for what you want. If you can pull that off the chances of creating a fabulous exhibit has increased a hundredfold!